I started running 14 years ago. I was mostly just an 11 year old kid who wanted to do well at the Presidential Physical Fitness Test's 1 mile run because I had been the fastest kid in my class the previous year when I clocked a smoking 6:29 (my 6th grade class had 12 students or so; Niobrara Public Elementary School is not large). 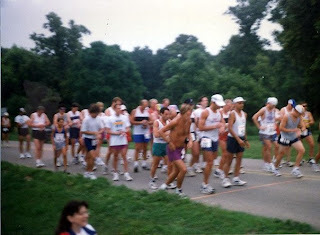 So, some time in February of 1995 I started running 1 mile per day to prepare for the P.E. class test some time in March. I ended up running 6:08. By my 12th birthday later that summer, I'd lowered that to a 5:32. 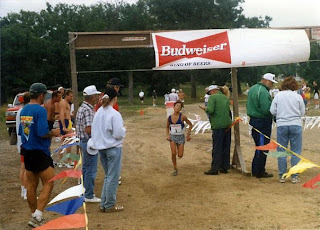 Because I had already consumed enough 70s-era running literature gleaned from the local Goodwills and second-hand bookstores, I began keeping a training log on April 12, 1995. It was in a spiral-bound, college-ruled notebook, the cover on which I soon glued a photocopied picture (see below) of Roger Bannister at the anguished moment of him breaking the finishing string of history's first sub-4minute mile. Anyways, the point of this post is that this past weekend marked 14 years of recorded running for me. So, after going back through all my logs, I came up with a lifetime total of 47340 miles for those first 14 years. Divide that number by 5113 days and the result is a mathematical average of 9.26 miles per day. For 14 years. I'll take it. As an aside, it just occurred to me that I am now roughly 2662 miles away from 50,000 lifetime miles, which seems like a nice round number. If I average 166 miles per week for the next 15 weeks or so, I should eclipse that milestone directly on my 26th birthday on August 2nd. We'll see. Sat-5:10 Section 16-Intemann-Rampart Range Road Overlook-Waldo-UPT. 6000' vertical. Sun-4:26 Jones Park-7 Bridges-Buckhorn-Dog Rock-Crystal Park Road. 5500' vertical. This was a pretty good week. I really felt "on point" for the Sunday run where all the climbs (a 3000' climb, a 1000' climb, and a 1500' climb) felt really solid, despite the snow. I also got in a good amount of barefoot this week, which I was hoping for. The Sunday run was out of control. I started the run at 6:30am when it was ~40F with low clouds. However, within 30 minutes it was sleeting, and that soon turned into enormous, floppy, wet flakes that were quickly accumulating until I was running through anywhere from 6-12" of the white stuff. This was fine until I became completely soaked through by precipitation that seemed to be half-snow/half-rain (typical springtime crap) that was just dumping out of the sky, and I was confronted with a 2500' six mile descent that didn't allow me to maintain a whole lot of body heat. The last three miles or so running through the streets back to my house found me plowing through ankle-deep slush/water and getting repeatedly sprayed by passing cars. Fun fun. I nearly got in the shower with my shoes still on because the lack of function in my fingers wouldn't allow me to untie the laces. It was actually great fun, and I was summarily heartened by the iconic passage from Thoreau's Walden that I heard on NPR upon exiting the shower: "I went to the woods because I wished to live deliberately." I'll spare you the rest of the marrow-suckingness in the passage that has almost become cliche, but suffice it to say that, if nothing else, during my run on Sunday morning I was certainly living deliberately and I emerged from it once again awakened and with my soul wide open. I have no other reason than that to do a run like that. Today I ran from my doorstep (always my number one preference) to the Bear Creek Canyon area here in southwestern Colorado Springs. The start of the true uphill (read: mountains) is only 2 miles away, and the singletrack starts only 3 miles away. I actually prefer this because I usually spend the first 20-30 minutes of a run moving slowly and awkwardly as the sleep and stiffness leaves my bones. The main reason I've been biking to Manitou for the past week or so is because Barr Trail offers a highly-trafficked route into higher altitudes when there is abundant (un-packed) snow on most other trails. With the last few days of warm weather, though, that is no longer the case, and today I was excited to get back to my more favored stomping grounds of the next-major-drainage-to-the-south-of-Ruxton/Englemann: Bear Creek. Today I took 666, the most direct ascending trail route in the area (also known somewhat affectionately as Balls-to-the-Wall and/0r El Diablo among Colorado College XC alums because of the 2000' of gain in three miles that kicks off the climb). This beautiful little singletrack ascends quickly along the southern (north-facing) wall of Bear Creek Canyon until it crosses over at about 8500' and flattens slightly over the next 1.5 miles where it deposits a runner in a beautiful opening in the valley at 9100', Jones Park. The trail passes waterfalls. It has inspiring views back out to the city. It offers several springs from which to drink. 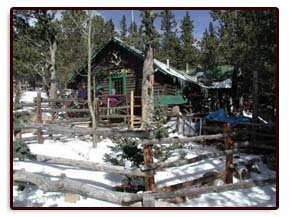 It is home to several groves of aspen. I love it. There are two things I love about running to Jones Park: 1) I very rarely see anyone. 2) Even though it is at 9100' (and only 8 miles from my doorstep), the network of trails up there has only begun and within another 5-10 miles of running I can be as high as 12,300'. I understand that Pikes Peak's Barr Trail has all the history and fame--and this certain race that is contested on it every August--but for me it's hardly worth it to run over there regularly in the summertime because of the literal crowds that are on the trail. Granted, it is badass to run to the top of a 14,000+' mountain. But, most of the time, a 12,300' mountain or two (Almagre and Baldy) and 11,500' Rosa will do for me. I look forward to getting back there consistently in the coming weeks and months. Today was a tough run. The weather was gorgeous; I ran shirtless the entire way, even at 10,200', but my legs just didn't have anything and I could pretty much tell it from the first step. This is to be expected. I'm about 10 days into a fairly significant step up in terms of training volume, and the back-to-back runs this weekend were definitely still in my legs. However, as much as a run like today's can be a drag, I see it as a sign that my body is preparing for a new level of fitness. As long as the stress isn't increased, maybe even slightly backed off, the body will recover, adapt, and come back even stronger. So, today I just tried to settle in and never push too hard knowing that is the best thing for the next day. A run like today's is most beneficial mentally, I believe. I did not want to run up a 4000' hill today. My body really didn't want to. But, this sort of effort is often what we ask of ourselves at the 70, 80, or 90 mile point of a 100 mile race (well, today's run actually wasn't nearly as painful as the 2nd half of a 100), and it helps me immeasurably to have rehearsed that sort of fatigue numerous times in training. The important thing is to monitor how I'm feeling the day after a particularly tough run because if that sort of fatigue lasts for more than a day or two, I know it's time to back off and make sure that I don't dig myself into a rut. However, the more common response from my body is that of renewed energy the day after a low-energy effort. And ultimately, today was one of those pristine mornings in the mountains that one wishes happened every day. The wind was low, the sun was high and bright, and the trail is progressively more and more ice/snow-free every day. Luckily enough, these sorts of days happen an awful lot here in Colorado/Manitou Springs. Sun-4:07 RRR Overlook to Waldo to Williams to RRR to Garden. ~5000' vertical. This was a nice solid first week of real training. I'm just hoping to stay consistent at this level for several weeks to come with the only real increase in volume to come from an (eventually, much) longer Saturday run and a few more barefoot miles in the evenings as the weather warms up and the grass is more inviting. A nice (and important, considering the nature of Western States' profile) bonus to doing a lot of vertical ascending is that my quads have to absorb all of that downhill, too. Finally, the NB MT100 is proving to be an excellent shoe. I wore it for all of my mountain runs this week (so, everything but Monday/Friday), and it is outstanding on the varied terrain that Colorado Springs has to offer, especially the rocks. It may warrant a post all to itself sometime in the near future. I took yet another trip up to see Neal and Teresa today. The little mini-storm that pummeled me in my evening jaunt last night left the trail quite a bit slower on an otherwise brilliant morning. There was ~1" on the Ws, 2" at No Name, and five fresh inches at Barr Camp itself. However, the soft snow provided some tacky footing on the usually icy downhill, so I was able to open up the stride a little more than usual. Some may question repeating the same run multiple days in a row, but for me it's all about consistency and doing something I enjoy. I don't get bored running the same trail, even when there are so many others to choose from. There's something comforting in the familiarity of a given run that usually makes it easier to endure (because, let's be serious, no matter how much I like running in the mountains, there are moments in a 4000' climb that are undeniably endured rather than, say, enjoyed). But, for me, it can all be summed up in a quote from the pioneering mountaineer Willie Unsoeld (among other things, first ascent of Everest's West Ridge), brought to my attention by a good friend: "Life begins at 10,000 feet." That alone should be enough reason to run to Barr Camp as often as possible. I ran up to Barr again this morning. The 4000' of climbing on the way up went without undue stress, but once I got there I knew it was time to turn around and scamper back down the mountain: the air was starting to emit flakes, and the Peak had already disappeared behind a veil of swirling greyness. As a result, the run on the way down was a game of cat and mouse with the clouds catching up to me on the flatter, icier stretches above No Name and then me plummeting back down into sunshine once I hit the Ws. Great fun. I made it back to the house just as the spring snow squall took over the Westside for a few minutes. Springtime in the Rockies; can't be beat. I realized today--after looking over my log for the past month--that I've actually not missed a day of running since Jocelyn's birthday (February 4th). I've had a weeklong stretch where I did little more than 40-60min jogs, but I still ran every day. When it comes to streaking, I tend to agree with Matt on this: streaking for streaking's sake is pretty dumb, especially when confronted with a serious overuse injury. But as a mind-game for promoting consistency, it does pretty well.